You can obtain a pet by completing Joen's quest in Wildlands, buying eggs from vendors in Wildlands and you can also buy rare species in Neon. After you have obtained a pet, you can see all of their details under the PETS button at the bottom of the screen. Please note pets are only active while in the Wildlands region. Pets will get hungry and need feeding. You can feed your pet by finding food for them, or buying the food from vendors. Click on the PETS button, click the pet you want to feed and click the FEED button to give them food. Each species of pet will eat different types of food, for example, Parricans eat berries. Your pet can be aged from an egg into an adult by using a Maturation Potion. Under the PETS button, click on the egg you want to age, click on USE ITEM and click on Maturation Potion. The potions can be bought at a potion vendor in Wildlands. 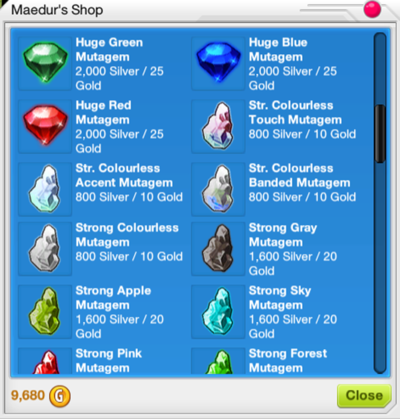 Coloured- These gems can change your pets appearance, for example, buying a Huge Pink Mutagem gives a higher chance of changing your pets colour to pink. Colourless - Colourless mutagems will remove a colour from your pet and return it to its original base colour. Different types of colourless mutagems affect different parts of your pet. Shaped - Shaped mutagems can help change the size or weight of your pet. Rare special shaped Mutagems can change certain pet traits, such as wing length or eyebrow length. Your pets will need a place to live and breed. These are called Habitats, and you can buy these from a Habitat vendor in Wildlands. You can place your pet in the Habitat by clicking on the PETS button, clicking on the creature you want to move to the habitat, and clicking on PLACE INTO HABITAT. If you have a higher end habitat, your pets will be automatically fed whilst in the habitat using the inbuilt autofeeder. Habitats also serve as a place for breeding; If you place an adult female and male of the same species into your habitat, they will breed and give you new eggs! Your pets are breedable! If you want to breed your pets to give you new eggs, you need to first click on the PETS button, and find a male and female pet you want to breed. They must be the same species to breed. Click on the male, and add him to a habitat by clicking PLACE INTO HABITAT. Do the same for the female. Make sure they are both adults, otherwise they cannot breed, and also make sure they are fed. Give it a little while, and you will have a new egg under the CREATURES button in your pet libary! You can equip your pet by clicking on the PETS button, clicking on the pet you want to equip and click the EQUIP button. This will allow your pet to visible in world right next to you, and follow you around! If you want to unequip your pet, click on the PETS button, click on the pet you have equipped, then click on UNEQUIP. If you don’t want to keep a particular pet anymore, you can release your pet into the wild. To do so, click on the PETS button, find the pet you want to release, click on them and then click on the RELEASE CREATURE button. A window will appear to ask you whether you want to release pet or keep pet, just in case you change your mind. Your pet can be placed into combat! Find an arena (These are marked by vendors with crossed swords above their heads; One is in Wildlands and one is in Sol) and click on the vendor. They will ask you if you want your pet to fight. Once in combat, you can choose different types of attacks by clicking the attack buttons on the left hand side of the screen. Your pets health and stamina will be displayed underneath the attack buttons, and the opponents health and stamina will be displayed on the right hand side of the screen. You will gain XP from the fight if you win or lose.